http://www.aljazeera.com/news/middleeast/2011/03/2011320180579476.html ), in a move that was later condemned as 'mutinous' by President Saleh. On December 19, 2012, al-Ahmar was effectively fired from his position by President Hadi as part of Hadi's efforts to restructure the military and remove the political and military elite remnant from former President Ali Abdullah Saleh's rule. The forces previously under al-Ahmar's command, most notably the First Armoured Division, will be absorbed into the Defence Ministry. 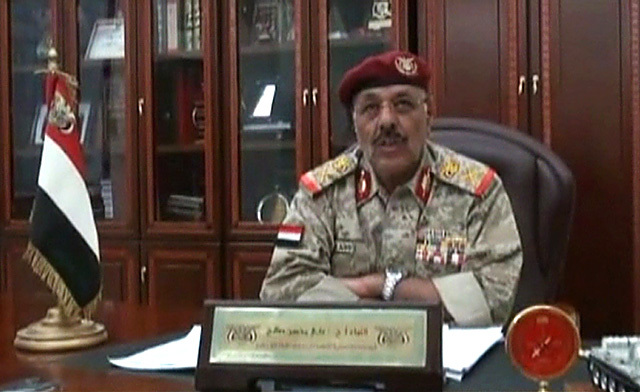 Also, General Ali Mohsen Saleh al-Ahmar has been linked with the al-Islah party and the militias that fought during the 2011-2012 Yemeni revolution. In fact, the image of the flag reported by Zoltán Horvath on March 21, 2011 can be seen in the embedded video in the Al Jazeera news report here.